The original wishbone style control arms (A & C) from Porsche were equipped with rubber bushings that deteriorate prematurely and fail. EPS has replaced this failure prone bushing with a stronger, solid polyurethane bushing with a metal protective socket. 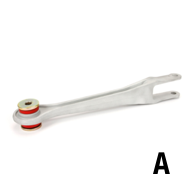 On the lower ball joint style control arms (B & D) EPS has taken the original Porsche control arm and threaded out the end to receive a heavy duty ball joint that can be easily replaced when worn. These upgrades will not only resolve your current clunking and rattling suspension noise, but will also save you time and money from replacing your control arms again. End the Squeal! Order yours today.